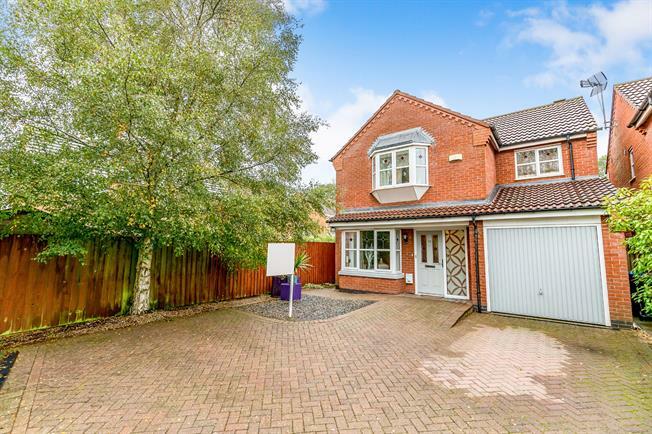 4 Bedroom Detached House For Sale in Lutterworth for Asking Price £310,000. Four bedroom detached family home in the ever so popular area, Saxon Chase. This immaculate spacious family home offers bright and spacious rooms throughout, the ground floor comprises of; entrance hall, living room with patio doors leading to the landscaped rear garden, modern and stylish fitted kitchen, utility room, separate dining room and W/C. Upstairs consists of; master bedroom with large amount of built in storage along with its own en-suite shower room, two double bedrooms, generous sized single bedroom and family bathroom. The rear garden has been landscaped kept to a high standard by the current owner. The front garden is mostly paved to provide off street parking for several cars, access to the garage and side access leading to the rear garden. An internal viewing is highly recommended to appreciate everything this wonderful family home has to offer.